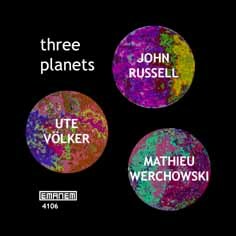 Acoustic guitar, cello or double bass, & percussion trio improvisations - intended for release as the third CAW LP, which never happened. A complete studio session featuring unique music. 76 minutes - previously unissued. 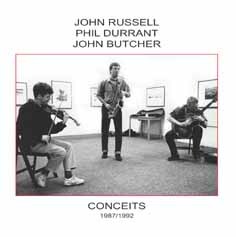 A reissue of the first LP by the exceptionally fine improvising trio of John Russell (guitar), Phil Durrant (violin and trombone) and John Butcher (saxophones). This group came into being in 1984 after Russell and Durrant had spent the previous two years performing in private with another saxophonist. For this debut LP, made in 1987, they performed eleven short pieces. 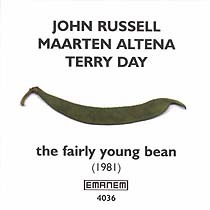 This CD has been expanded by the inclusion of a previously unissued extended concert performance made a few years later. The strong beginnings of one of the best improvising groups of the 1980s and 1990s. Reissue of Acta LP 1 with extra material. 54 minutes. Classic quintet improvising by an ad hoc grouping that quickly became a group lasting for several years. 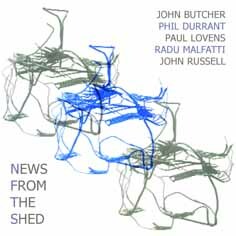 JOHN BUTCHER (tenor & soprano saxophones), PHIL DURRANT (violin & electronics), PAUL LOVENS (selected drums, cymbals & saw), RADU MALFATTI (trombone, zither & accessories), JOHN RUSSELL (acoustic guitar). Reissue of Acta LP 4 with extra material. 63 minutes. 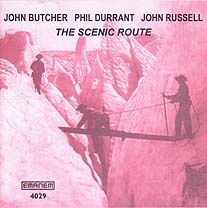 4056 CHRIS BURN ENSEMBLE "The Place 1991"
Adventurous acoustic guitar & percussion improvisations by two of the finest musicians around. A remarkable range of sounds without any amplification or other electronics, captured in a digital recording that reveals every nuance. "The whole CD sounds incredibly crisp and fresh. 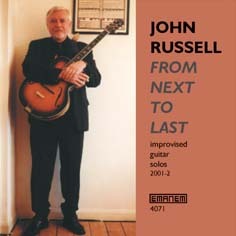 One of the best CDs of improvised music I ever heard." (Luc Houtkamp from an unsolicited email.) 69 minutes. 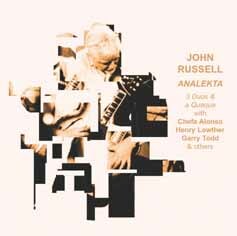 Most of two concert performances by this exceptional all acoustic saxophone / violin / guitar trio, featuring somewhat longer and sparser improvisations that on their previous issues. 67 minutes. 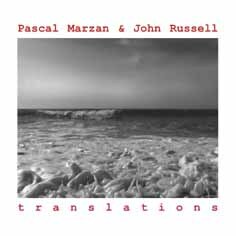 A second helping of adventurous acoustic guitar & percussion improvisations by two of the finest musicians around (see also "Birthdays"). A remarkable range of sounds without any amplification or other electronics. Even though they played their first duo gig in 1978, they still keep coming up with incredibly fresh and inventive music. 69 minutes. 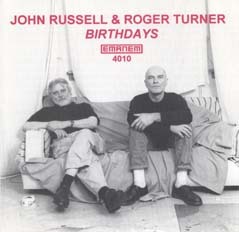 4205 freedom of the city 2001 "small groups"
For his second solo album - the first was recorded in 1978 - Russell concentrates exclusively on acoustic guitar improvisations. Recorded both in private and in concert. 71 minutes. 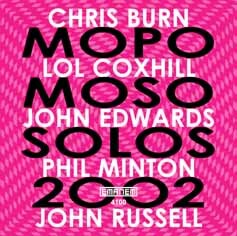 4210 freedom of the city 2002 "small groups"
A concert featuring superb unaccompanied solo improvisations by JOHN RUSSELL guitar, PHIL MINTON voice, JOHN EDWARDS double bass, LOL COXHILL soprano saxophone and CHRIS BURN piano & percussion. Then they finished the evening as an impromptu quintet. 70 minutes. 4212 freedom of the city 2003 "small groups"
A very fine acoustic (guitar, accordion and violin) improvising trio, made up of three musicians of three different ages from three different countries. Put together by a promoter for a French festival in 2001, they related so well that they have continued to get together whenever possible to make great music. 79 minutes. 4215 freedom of the city 2004 "small groups"
Three duos and a Quaqua. 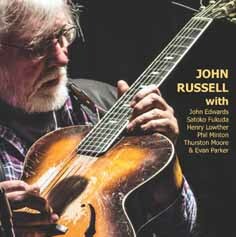 Russell's monthly Mopomoso concerts usually end with him playing a duo - this CD contains three examples. The guitarist's first duo with tenor saxophonist GARRY TODD was in 1975 and appeared on a long deleted Incus LP TEATIME (reissued as EMANEM 5009) - this is a reunion 30 years later. 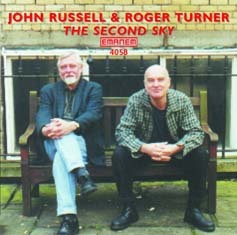 An ongoing duo has been that of Russell and jazz trumpeter HENRY LOWTHER - not as unlikely as it may seem. CHEFA ALONSO, who plays soprano saxophone and percussion, is a new encounter for the guitarist, but one with a lot of improvising experience and skill. Also included is the nine-piece Quaqua that Russell organised for the 2006 FREEDOM OF THE CITY festival with NICOLE LEGROS & JEAN-MICHEL VAN SCHOUWBURG (voices), STEFAN KEUNE (alto saxophone), PHILIPP WACHSMANN (violin), ASHLEY WALES (piano), IVOR KALLIN (double bass), JAVIER CARMONA (percussion), and STEVE BERESFORD (electronics). 78 minutes. 4137 TERRY DAY "2006 Duos"
Improvised guitar duets recorded at two dates by two very different musicians from two countries. In spite (or perhaps, because) of their differences, the French nylon-strung and the English steel-strung guitarists fit together hand-in-glove. Once again the world of free improvisation encompasses and fuses musicians from very different backgrounds to create a unified whole. 73 minutes.